The hub, which comprises eight 50kW rapid chargers, is operated by BP Chargemaster as part of its Polar network and has already been used to charge more than 500 electric vehicles since it went live. It’s located within a minute’s drive of the M1, just off junction 14 at Milton Keynes Coachway, and was designed and constructed by Milton Keynes Council as part of its Go Ultra Low City programme. 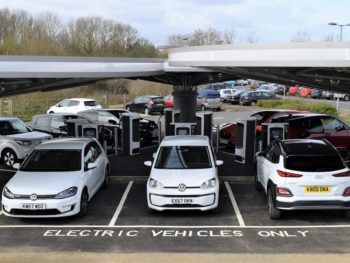 Funding came from the Office for Low Emission Vehicles (OLEV), as part of a £9m investment package to support the growth of electric vehicles in Milton Keynes. The official opening ceremony was presided over by Councillor Martin Petchey, Mayor of Milton Keynes, along with Brian Matthews, head of transport innovation at Milton Keynes Council, and David Martell, chief executive of BP Chargemaster.